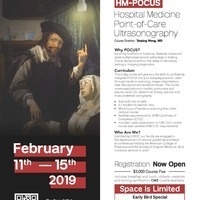 Our next 5-day class in Hospital Medicine Point of Care Ultrasonography (HM-POCUS) will take place February 11-15, 2019. It is a New York City and a North East Regional event hosted by Cornell HM-POCUS group. The class fulfills requerements for Society of Hospital Medicine PCOCUS Certification Track. To register, or for more indormation vist hmpocus.weill.cornell.edu or email hmpocus@med.cornell.edu.